Alex Colville is a Canadian realist artist of great international repute. Fischer Fine Art, which exhibited this work in 1977, was Alex Colville’s dealer in London, England for many years. Great interest was taken in Colville’s work by European museums and collectors, reflected in the fact that the painting for this fine study is in the collection of Germany’s Staatliche Museen zu Berlin. In the catalogue for the 1977 exhibition that included the painting Laser, the text was also in German. In preparing for his paintings, Colville does a series of studies in which he determines sightlines, compositional elements and colour, and an acrylic work would likely have evolved from earlier pencil drawings. In this vital study which contains all the main elements of the final painting, the figure’s face is partially hidden. 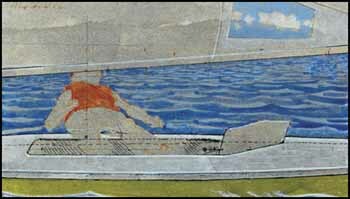 The main focus is on the balance and tautness of the body in assured control of the boat, in harmony with wind and water. With his careful observations and distillations of pictorial elements Colville shapes his image, transforming the known world into something extraordinary.